Next up, Kawasaki’s 650 Versys as I continue my lifelong quest of an optimal mid-weight travel bike. 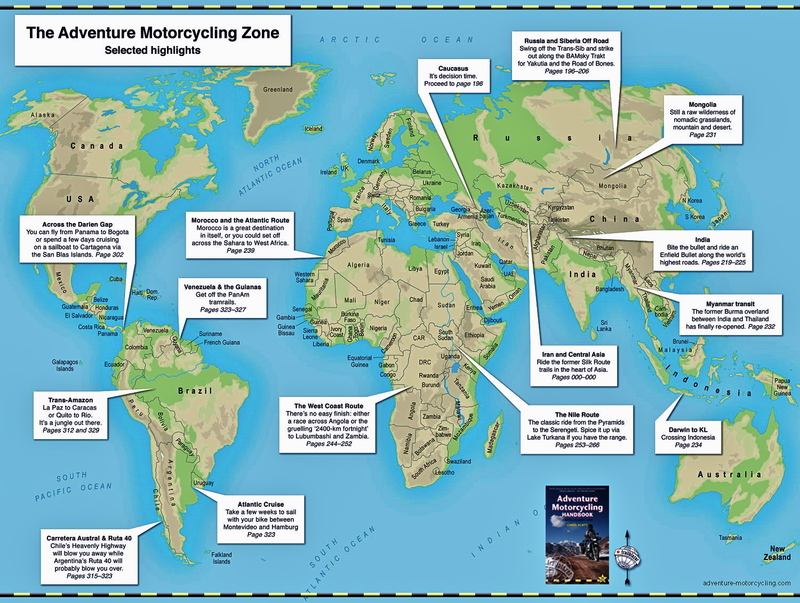 As you may have read, I had a short affair with a TDM 900 but, great though it was, it soon became clear the TDM was too far down the roadbike road to be hauled back towards its Super Tenere and Dakar Rally origins. The origins of the Versys are less glamourous. 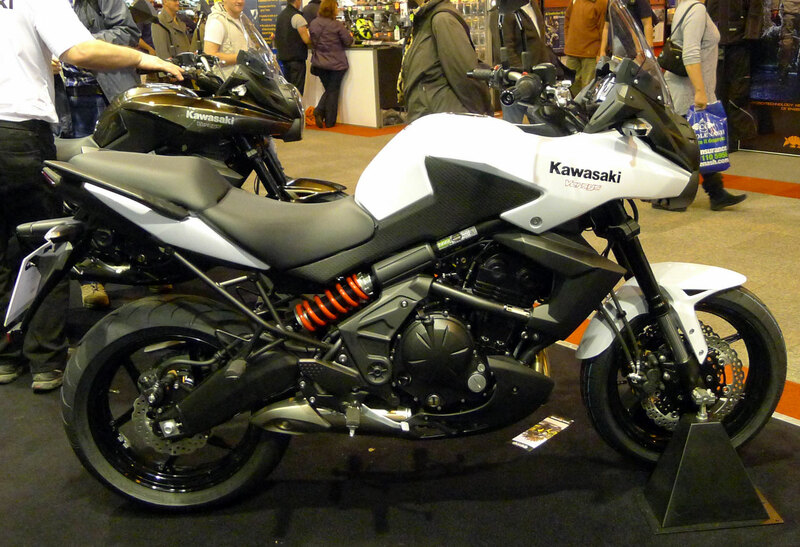 Also known as a KLE650, before it came the KLE500 which in its brief final form I came close to buying. The 500’s motor was based on the sheep-in-wolf’s-clothing GPz500 or Ninja (below right) which dat es way back to 1987. For reasons I forget, it wasn’t a contender back when it came to making my Gs500R project bike a couple of years ago. I think there was something about a dodgy top end? compared to the Suzuki’s better record. But looking at KLE500s again a few weeks ago, they now rather obviously resembled what I eventually produced in the GS500R: 18/21-inch wheels; decent tank capacity and suspension travel; a bit of fairing protection and a flat seat. Plus the last model in blue with gold frame and wheels looked downright elegant compared to some of the earlier KLE’s challenging colour combos. There’s a certain ‘honest old school hack’ appeal about a KLE500 that you don’t get with a modern electronic bike, but rosy-specs aside, carbs, tubed tyres and 21-inch front wheels are things I prefer to leave behind. Then it dawned on me that a KLE was in fact a last-gasp, emissions-choked throw of an old 500 engine, just as the paint was drying on the brand new Euro 3-compliant Versys back in Japan. So it was just another affable dinosaur with a motor necessarily strangled by all sorts of clumsily added emissions claptrap prior to the whole KLE concept getting redesigned from the ground up as a 650. Recognising this, the 500 didn’t look so appealing anymore, especially when you consider UK prices for a decent, last-model example start in the high teens and occasionally run up to nearly three grand! Of course I never actually got to ride one, but I don’t think it would have been too much of an improvement over my GS-R. I remember taking that picture on the right at the 2012 NEC Show and thinking ‘man, that is one ugly bike: too tall, too plasticy and too darn lardy on its ill-proportioned 17-inch wheels. You’ll never catch me on one of those’. It was some way from the 99-kilo KTM Freeride which was the ‘bike de jour’ at the time. Two and a bit years later I find myself reappraising the Versys for a more functional potential. It was an interesting lesson in how initial prejudices based on looks can be overcome once you look a bit deeper. That happens to me a lot. 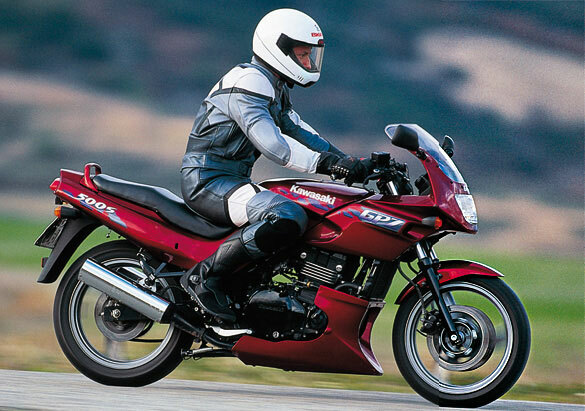 Much of the V-bike’s new-found appeal came down to the used prices when compared to similar offerings like TAs, V-Stroms, the KLE500 and the newer CB500-X which I tested a few weeks back. Bide your time and you can find a good, late 1st-gen (2007-09) Versys for a little over two grand. Especially alongside a 500, that’s a whole lot more bike for the money. The main flaw is of course that, just as with the Super Tenere-to-TDM evolution, the supposedly all-dancing Versys actually became less ‘versytile’ by adopting fat 17s front and rear. 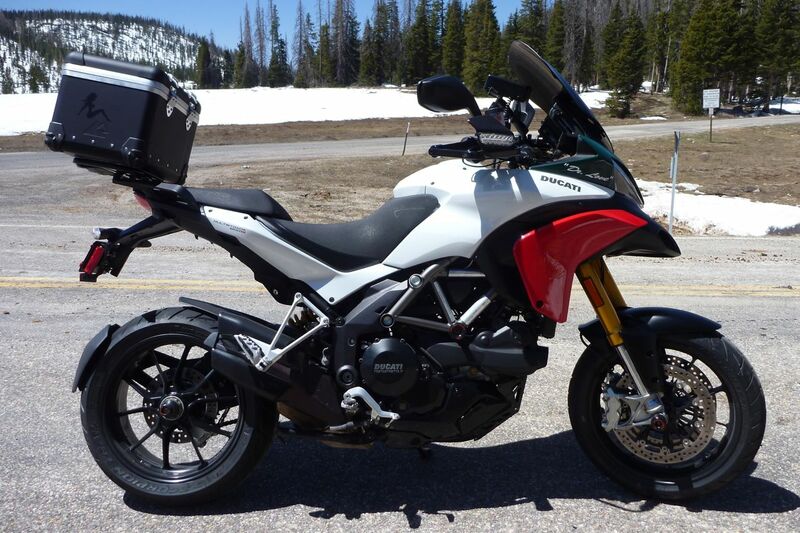 IMO like Ducati’s Hyperstrada (right), it doesn’t do the bike’s aesthetic proportions any favours at all but is probably another example of me mistakenly judging a book by its cover. With the 650s ground-up makeover came the typical 20 extra kilos, but also tubeless tyres √, efi √, what looks like a chunky subframe (above right) √, optional ABS √, easy to adjust shock √, easy-switch km/miles speedo and you’d hope a general refinement plus enough plastic to melt down into a giant Rubik’s Cube. The deeply stepped seat looked less promising (though worked well enough on my 660Z Tenere), as did the under-engine silencer’s vulnerability, even if it kept the back-end slim for saddlebags. At 19 litres, the tank has a near-ballpark capacity of 250-miles/400kms assuming 60mpg (21.2kpl) without the need to carry extra fuel, even if that weight isn’t low, as it was on my XCountry. 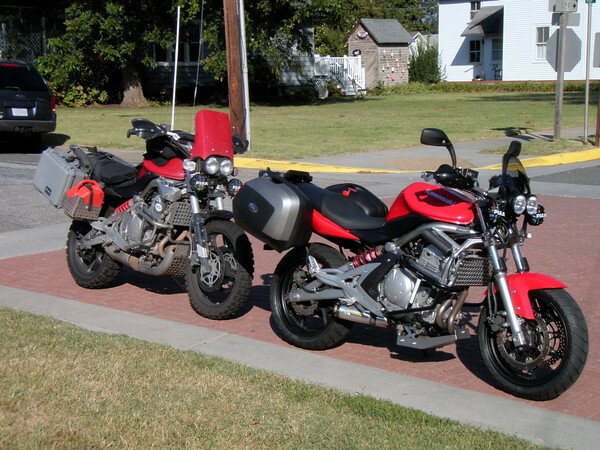 Pictured left are two Adversii built by a guy calling himself jdrocks on advrider. He spends his winters building up V-bikes for something to do and has an admirable ‘keep it simple and costs low’ attitude, stalking craigslist for as long as it takes to snag used parts from crashed 650s, rather than hosing his rig down with a Touratech catalogue. I can relate to that. The red one on the left is actually an ER-6n/Ninja with Versys USD forks, the road bike which the GPz became. If you’re planning to turn your 650 Versys or Ninja into a lunar rover, set a rainy weekend aside to read jd’s posts. You’ll learn that he’s unearthed benefits in adventurising a 650 Ninja over a Versys (chiefly better power from cams, compression and CPU in the otherwise identical engines). 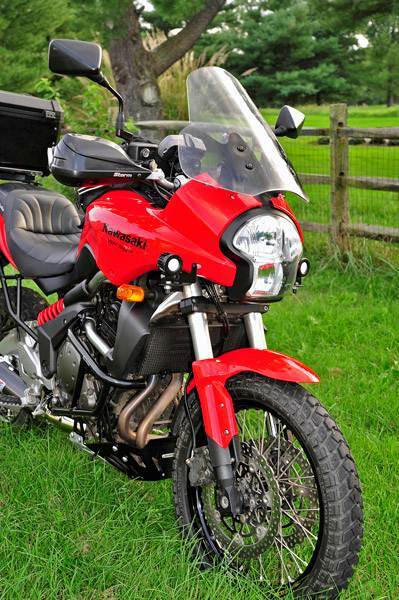 But here in the UK comparable ERs go for a bit more than a Versys. With nowhere to work and looking for a bargain, I wasn’t planning anywhere near as radical a transformation as his, so was happy to settle on a Versys. 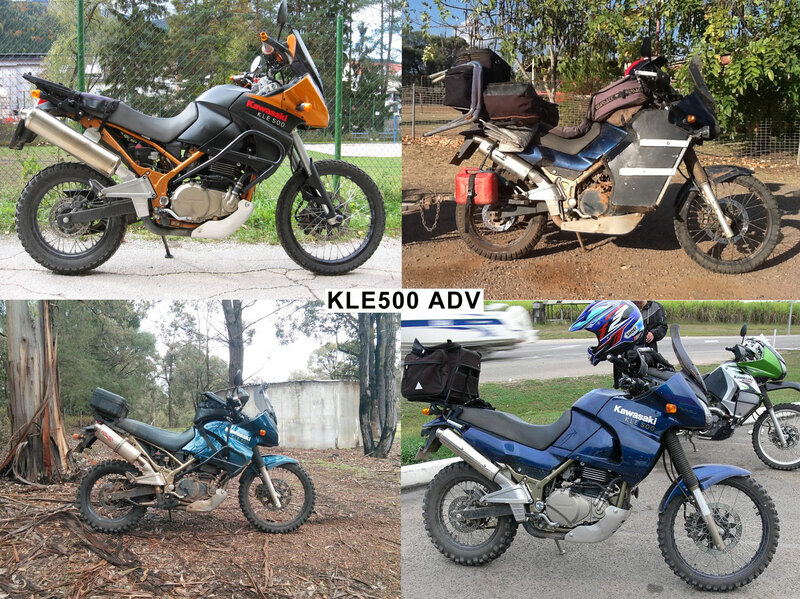 Uncovering all this brought up another benefit of adapting a Versys into what jd calls a ‘gravel bike’: they’ve been around since 2008 in the US where similar XT-Zs, ATs and Transalps aren’t sold and F-series BMs are pricey. Because of that, enough people have Adversysed their 650 Kawas. Be it simply slapping a ‘rear’ TKC on the front (blue bike, above) Advrider is awash with ideas and know-how which all saves money, frustration and time. 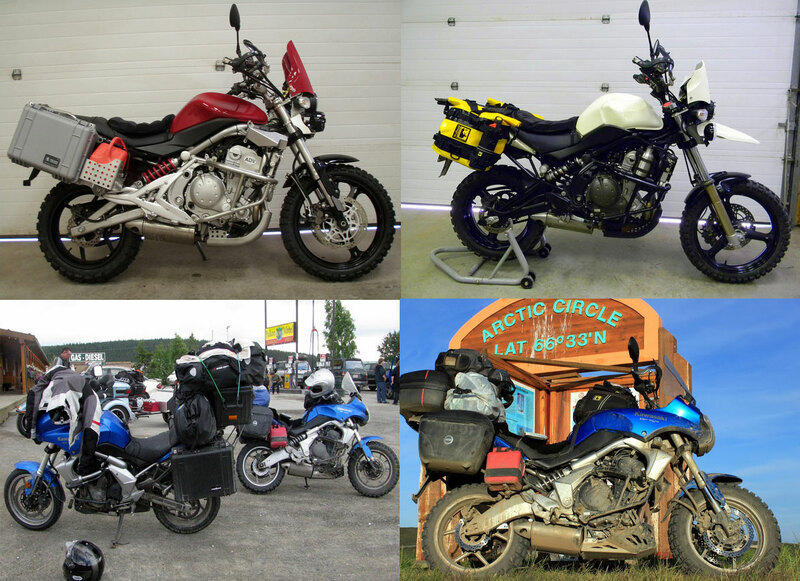 AdvMoto magazine were among the first to set the ball rolling, spending what looked like the cost of a second bike adapting a used 2008 Versys with hand-built wheels and every accessory under the sun (left). The result was not a dirt tourer that was not great value for money but then being to try something new can be costly. 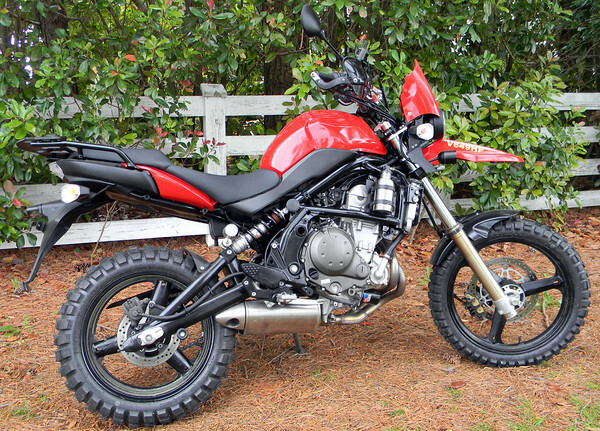 I did think about getting a V-Strom, but part of this whole AMH project bike game is trying out less obvious ideas without spending a fortune. There’s nothing much to prove with the much admired Suzuki and anyway, in the UK they cost more than a similar or even a younger Versys. It only took a week of so to find one nearby for an unlikely £3000, but offered a chance to have a closer look and see how it rode. This was one of the full black versions which I find the least ugly. With chrome only present on the forks and pipe, it all blends away like a black cat in a coal cellar. All you have to do is be careful not to look that Fiat-ugly headlight in the eye. 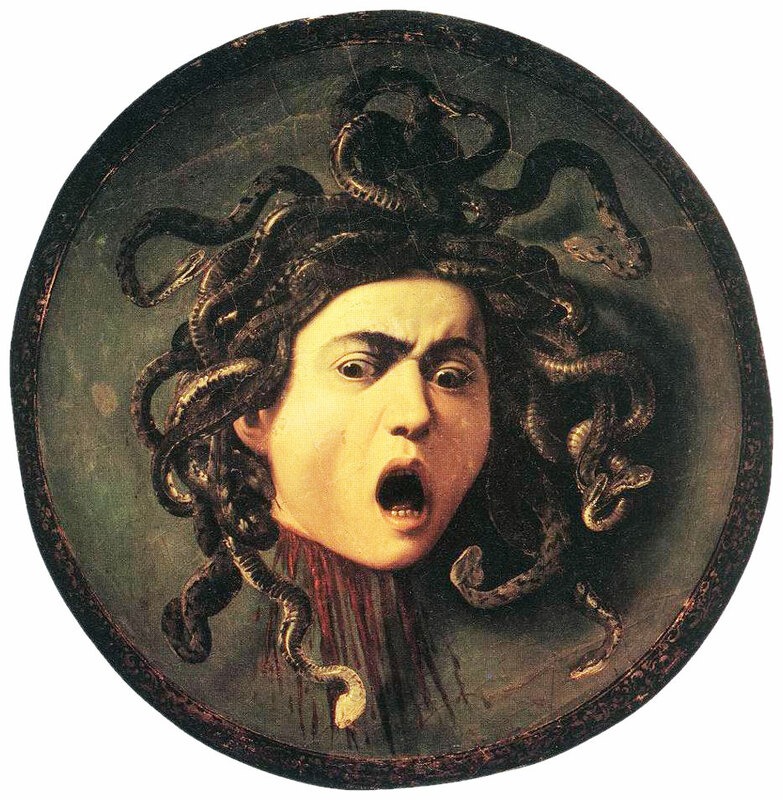 Do so and, like clocking the Medusa (right – don’t look! ), you’ll turn to stone. Another all-black V-bike (left) turned up up north where all the used bikes seem to be. I picked it up unseen one chilly Sunday morning and by the time I got home and then flogged the overpriced ‘gel seat’ that came with it, it came in at £2100 with hot grips; light-but-noisy pipe + original; hugger; 12v plug; new back tyre and 28,028 miles on the clock. On the surface all good but some rust behind the scenes. More about it in the next post. 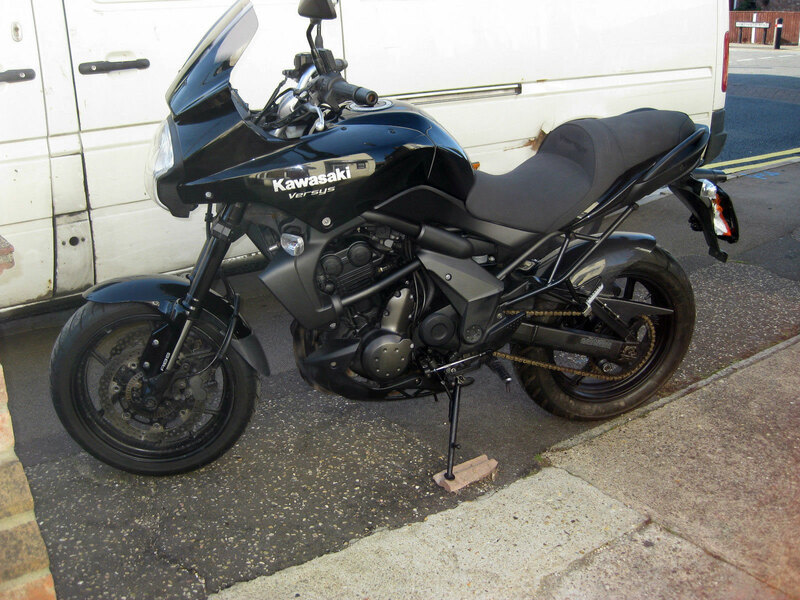 This entry was posted in AMH News, Project Bikes and tagged Adversys, kawasaki ER6n, kawasaki versys, KLE500. Bookmark the permalink.